Welfarm / Welfarm.fr / Screenshot A new video from Welfarm says it shows evidence of mares being mistreated in "blood farms"
The video, which Welfarm says was filmed in January this year (2018), shows pregnant mares being beaten in so-called “blood farms”, where their hormone-rich blood is regularly extracted. The hormone in question is “equine chorionic gonadotropin”, or eCG, also known as pregnant mare serum gonadotropin (PMSG). It is used by farmers in Europe, including France, to “make female sheep, goats and pigs ovulate on demand”, and is especially prevalent in the piglet industry, a statement from Welfarm said. The group added that the mares are impregnated for their hormones, and their pregnancies are then terminated once enough blood has been collected. 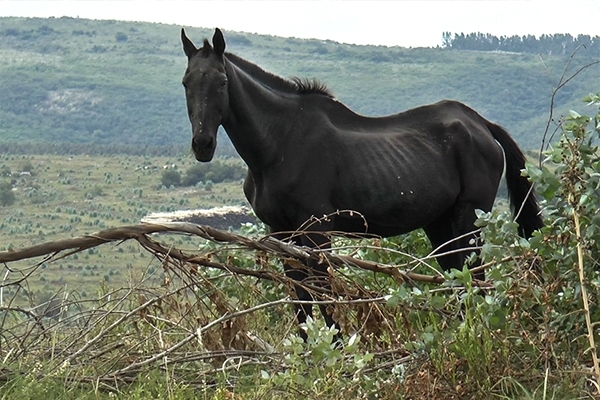 The mares are said to be raised in poor conditions without adequate food or healthcare, and once they cannot be impregnated anymore, they are usually slaughtered and sold as meat. Welfarm said: "In Argentina and Uruguay, animal protection laws are nearly non-existent. This allows [European] laboratories to buy eCG at a low cost." News of this practice - which Welfarm has called “a scandal” - first hit Europe in October 2017, after an investigation by two animal welfare groups: TSB in Switzerland, and AWF in Germany. France imported five million dollars’ (€4,289,000)-worth of eCG from Uruguayan hormone company Syntex in 2017, Welfarm said, citing documents from the Uruguayan customs office. Now, Welfarm is calling for a ban on the blood imports, and has launched a petition to raise awareness and put pressure on all laboratories that sell the hormone in France. It is asking for an end to all imports of eCG from South America to Europe, and wants to see a synthetic hormone alternative put to market instead.